I can't believe that we are already at the end of July! Like, where has summer gone? Does anyone know? Anyway, I digress. With summer nearing, its end it has me thinking about back-to-school. I used to love this time of year. The new school supplies, new clothes, all the things. The one thing I didn't think about was how my parents got dinner on the table every night in the midst of the chaos. That's why I have decided to dedicate the month of August to quick and easy one-pot meals and sheet pan dinners. 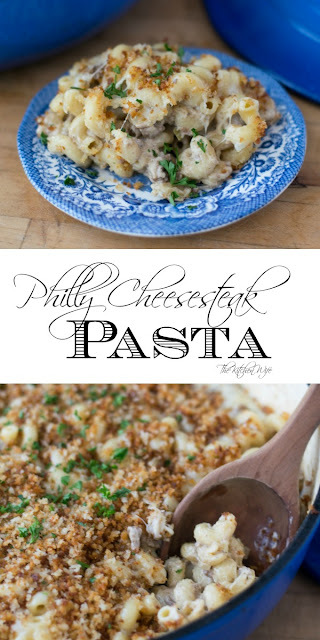 To kick things off I am sharing this delicious One-Pot Philly Cheesesteak Pasta Recipe. One of the things I LOVE about this recipe is that it uses a few simple ingredients that you may very well have on hand! This recipe makes A LOT of food, so you will need a DEEP skillet. Place your pan over MEDIUM/HIGH heat and add a little olive oil. Place the ground beef in to the hot pan and cook until brown and no longer pink. While the meat in browning you can dice up the green pepper and onion. Once the meat is fully cooked you can add the green pepper and onion to the pan with the minced garlic. Add the uncooked pasta to the pan. 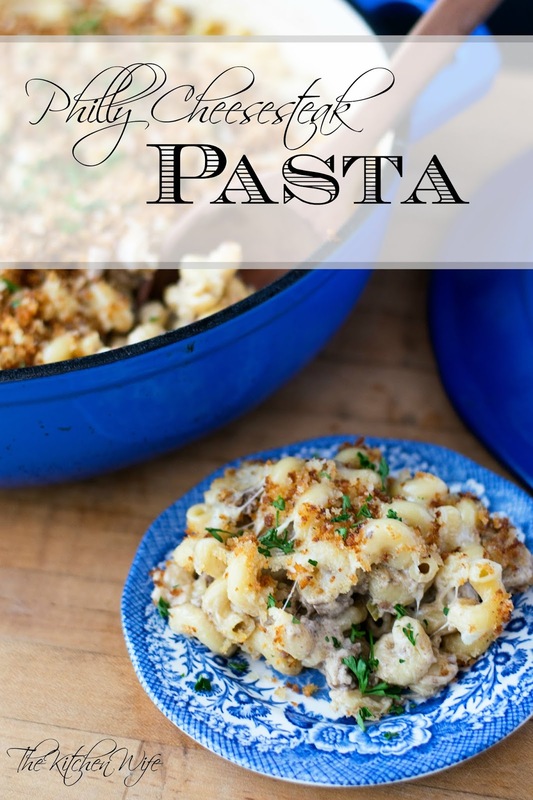 You can use any pasta you like, but I think this cork screw style pasta is super fun! Next add the Worcestershire sauce and stir everything together. Bring to a low boil, cover and cook for 15 minutes, stirring occasionally. Once the pasta is cooked it should look something like this. There will still be a little bit of liquid in the pan, but that is fine. DON'T DRAIN! This will become part of the sauce. Now you can cut the room temperature cream cheese into squares. Stir everything together until everything is coated in this luscious, creamy sauce. 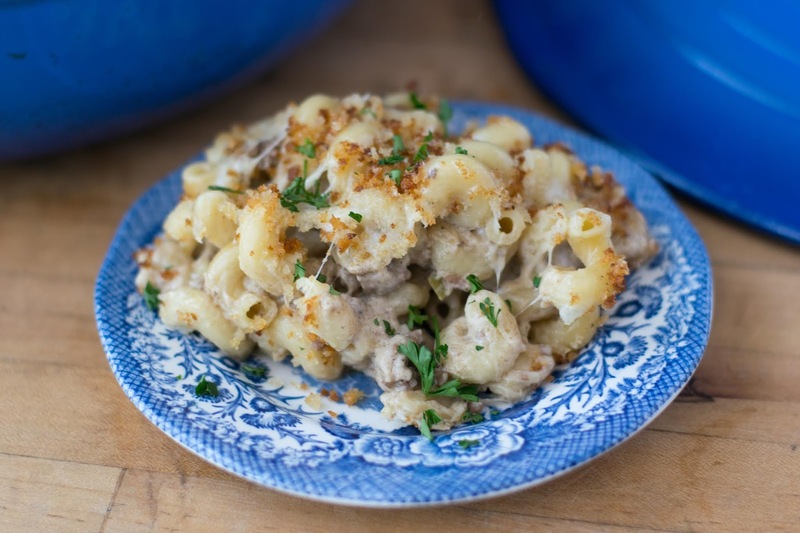 Now, as if the One-Pot Philly Cheesesteak Pasta wasn't cheesy enough, we are going to top the pan with the slices of provolone. Then I decided I wanted a little crunch factor, so I melted a couple tablespoons of butter in a pan and browned up some Panko breadcrumbs and added to the top. Place the lid on the pan and let the cheese melt. Then you are ready to eat! Can you believe how simple this was? Oh, and the fact that you were able to make it all in ONE POT is a bonus! I like to serve this One-Pot Philly Cheesesteak Recipe with a nice chopped salad. 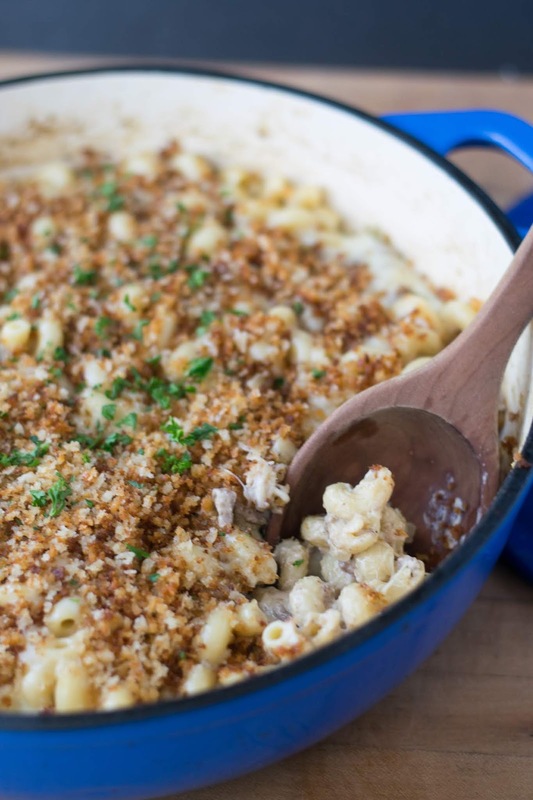 It really is the perfect, quick and easy weeknight meal. I know you and your family are going to love it so get in the kitchen and make it TONIGHT! Place your DEEP pan over a medium/high heat and add a little oil. Place your ground beef in the pan and cook until brown and no longer pink. Add the bell pepper, onion and garlic to the pan. Add the uncooked pasta to the pan along with the beef broth, Worcestershire sauce, and water. Stir everything together, bring to a boil, cover and cook for 15 minutes. Stir occasionally. After the pasta is fully cooked, add the cream cheese and shredded mozzarella. *To toast the bread crumbs, melt a couple tablespoons of butter in a pan and add the bread crumbs. Stir until lightly brown. What brand/size is the blue cookware you are using? Hi Cait, I am using a 5qt braiser, but I have seen people make this in deep skillets or dutch ovens.